Before I get this party started, I must say thanks to everyone for all your sweet prayers, thoughts and phone calls. It’s always a blessing to feel loved! In case you don’t know or haven’t heard yet, Lovebug was involved in a car chase /shooting / fight while working last Tuesday night. During a physical altercation with one of the suspects, he broke his hand. Me: Well, Actually, I don’t remember what I said at this point. All I remember was throwing Evan in the back of the car and heading over to my in-laws where I dropped Evan off. Once I pulled into their driveway, my father-in-law was outside ready and waiting on me. He said he would drive me and I was so very thankful because Lovebug was at Colleton Medical Center in Walterboro and I had no earthly idea how to get there. I couldn’t help but chuckle when I saw my father-in-law waiting. He had his Nissan Sentra backed in the driveway and ready to roll. When he’s not driving his big diesel-powered Ford truck, he opts for a Nissan Sentra. He’s a man of many disguises! All in all, Lovebug is doing very well. He is scheduled to have surgery on his hand this Wednesday to set the bones, in which plates and pins will be used. Since two bones were broken, the doctor was unable to set both of them in the office…hence, surgery. 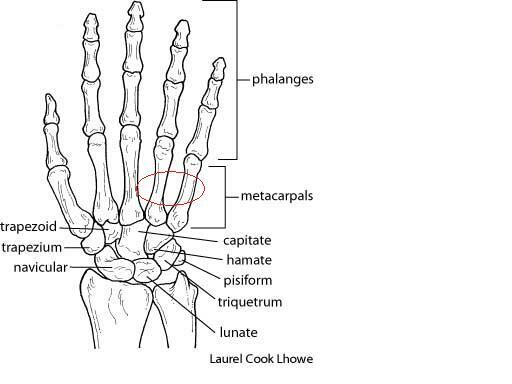 He broke two of his metacarpals. More specifically, the ones circled in red. I’m just so happy these criminals are behind bars. The Post and Courier article below details their pending charges from Las Vegas, Nevada. I have no words for people like these! Bail was denied for two men accused of shooting at Dorchester County sheriff’s deputies during a high-speed pursuit last week. The chase began about 7 p.m. July 12 when a deputy tried to stop a car for an an unlawful lane change on I-95. The car at first looked as if it were going to stop, but it then sped off, leading deputies on a chase off the interstate and onto S.C. Highway 61. At one point, one of the two men inside the car popped his head out of the moonroof and began firing at pursuing deputies. A deputy rammed the car, causing it to flip over and the men jumped out and ran into the woods. The two men were eventually captured by police dogs. A deputy broke his hand in the incident, Dorchester County sheriff’s Maj. John Garrison said. Both men were taken to the Colleton County Medical Center to be checked out, then to the Dorchester County Detention Center, Garrison said. Deputies found guns in the car, an Acura, which was reported stolen in North Carolina, Garrison said. 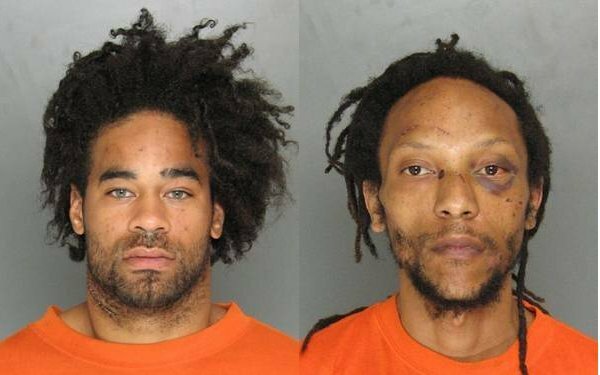 Maurio D. Rivers, 34, and Bronson Shelley, both of Morris Street in Charleston, are each charged by the Colleton County Sheriff’s Office with two counts of attempted murder and one count of possession of a weapon during the commission of a violent crime. Both also are charged by the Dorchester County Sheriff’s Office with failure to stop for a blue light and possession of a stolen motor vehicle. According to the Las Vegas Metopolitan Police Department, Bronson is also wanted in Nevada for pandering a child, child endangerment, living from the earnings of a prostitute and furnishing transportation to a prostitute. At a bond hearing Friday, Colleton County Magistrate Keisha D. Gadsden denied bond on the attempted murder charges and set bail at $10,000 each for both men on the weapons charge, a court official said. Wow! Great blog and even though I don’t know your husband,I’m from NC, sounds like he is an exceptional cop. Thanks for protecting us and may justice be given to these thugs. jenny Next time tell him to use his flash light it,s harder than your hand and it can be replaced ha,ha. popa george. Wow…. How did I miss this Jenny? Love bug? Would that be Tim? How sweet!